The family-owned and operated Miele is a well-known German manufacturer of domestic appliances, on the higher end of the appliances spectrum. They manufacture commercial equipment as well, but that’s not the focus of this guide. What this over-a-century-old company is particularly known for are their vacuum cleaners that pass through intensive endurance testing before hitting the market. In fact, in case of its high-end appliances, Miele simulates close to two decades of use as part of its endurance testing process. The Miele Compact C2 Cat & Dog PowerLine vacuum cleaner is a cylinder vacuum that is designed specifically for dealing with pet hair. I know exactly how pesky dog and cat hair can be. They embed themselves in sofa covers, carpets, upholstery and clothes. They get into nooks and crannies in the house, making it difficult to clean. This vacuum cleaner is equipped with a TurboTeQ floorhead, which deals with these pesky pet hairs better than anything else. In addition, it also absorbs bad odours, which is a major help if you have a four-legged friend staying over at your place. 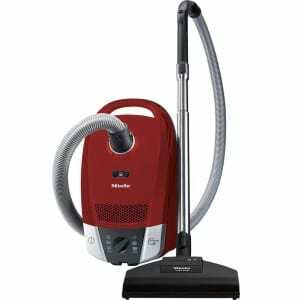 The slightly higher price you will be paying for the Miele Compact C2 Cat & Dog PowerLine vacuum cleaner is worth every penny because it essentially is a multi-purpose appliance. It cleans the house, plays a part in improving the household health, takes care of hair shed by your pet(s) and it’s durable as well. The dust bag has a capacity of 4.5 litres. It requires 890 Watts of power. Energy Efficiency Class: A+++ to D.
The Compact C2 weighs in at under 5 kgs, with a capacity of 3.5 litres. This means it is one of the lighter vacuums on the market. The sealed casing is excellent and ensures none of the dust captured inside it escapes. In fact, this seems like a bonus given that it has an 11-stage filtration system. The vacuum cleaner’s operating radius stands at 10m, which will allow you to comfortably move around as you go about cleaning without having to switch from one socket to another. I’ve already mentioned the specialised floorhead this vacuum cleaner is equipped with, allowing it to extract any hair stuck to carpets and upholstery. Also, especially pleasing for pet owners is the odour absorption feature. Then there’s the turbo brush, which has a spinning roller specifically to deal with hair. I would also like to draw your attention towards the 6-stage rotary dial, which enables you to select the ideal suction level for the cleaning job you’re tackling. The Compact C2 has a few additional attachments such as upholstery nozzle, crevice tool, dusting brush and more. All of these are simple to attach and easy to use. Miele employs multiple layers of filtration technology in its vacuum cleaners, including High-Efficiency Particulate Air (HEPA) filters that are specially designed to capture the fine dust particles. In order for an air filter to meet the HEPA standard, it first has to satisfy efficiency standards set by the European Committee for Standardization (CEN). So, Miele vacuum cleaners do much more than just clean your house. They have a significant impact on the air quality indoors and thereby improve living conditions and your health. The increase in air pollution over the past few years has resulted in a much larger concentration of dust particles inside the house, some of which cause allergies. It’s harmful to the average adult, but more so for children and the elderly. Along with shedding copious amounts of hair, our furry friends are sometimes also responsible for nasty odours. On occasion, I feel lazy to clean up but my family and friends don’t always appreciate it, so the Active AirClean filter sounds particularly good. It is equipped with active charcoal, which enables it to absorb any such disagreeable odours. The filter comes with an expiration date, after which you would have to replace it to get the best results. The Compact C2 comes with two floorheads – the standard floorhead and the TurboTeQ Floorhead. The latter is particularly helpful in dealing with hair that’s stuck in the crevices of a deep pile carpet or on the sofa. It’s important to get rid of this hair because it could later result in allergies and breathing issues. My research suggests that one of the primary vacuum cleaner issues customers complain about is the fact that bagless vacuum cleaners leak a part of the dust and other particles captured. The sealed casing of the dust bag in Compact C2 takes care of that problem. Efficient in cleaning dust off of various surface textures, including carpets and wooden or marble floors. Sealed dust bag with large capacity. The turbo brush does an excellent job in dealing with hair. The odour absorption feature is nifty. The price can almost seem prohibitive. The HEPA filter needs to be changed at regular intervals, ideally once a year, which is an expensive affair. The dust bags also have to be changed regularly. The Compact C2 an efficient and robust piece of technology. 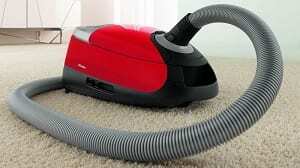 As a pet owner, this is one vacuum cleaner you should definitely consider investing in. For me what tips the scale towards this particular vacuum cleaner is that it presents solutions to multiple pain points. An indoor air filtration system is fast becoming a necessity. The HEPA filtration system in this vacuum helps solve that problem to a certain extent by removing a very high percentage of the fine particulate dust inside the house. Then comes the pet specific features. Here too the Compact C2 does a very good job with two key issues — pesky pet hair that gets stuck in fabric or carpets and the unpleasant odours that are inevitable with pets in the house. On both counts, this vacuum does a commendable job. I agree the price is without a doubt on the higher side, but I think it will prove to be a worthy investment.